The Tummy Tales: Spaghetti Alio E Olio (Italy). The World on My Plate Series! 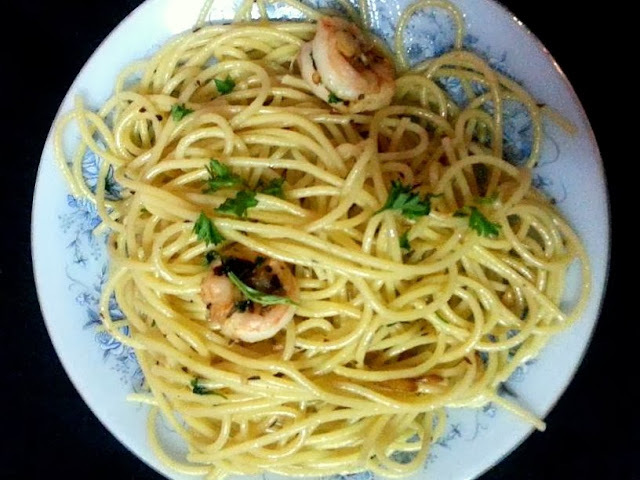 Spaghetti Alio E Olio (Italy). The World on My Plate Series! The dish was simple, the post was going to be even simpler. But in about thirty odd minutes of dinner last night, we were in a spell. A spell that made us drool with ecstasy. Each bite appealed to each and every sense, leaving you with a nostalgic “morning after” smile. Let me tell you how it happened. When I had planned “The world my plate series” I was clear that there would be Italian and it had to be spaghetti. Probably, because spaghetti is my favorite variant of pasta. A few days ago, while gallivanting through the supermarket, I picked a pack of spaghetti. Then a few search attempts on Google threw up a rather strange sounding dish “Spaghetti Alio E Olio” translated to Spaghetti in garlic, chillies and olive oil. There had to be some merit I thought. More reading told me it was an Italian nonna classic. On face value, this seems a very simple dish, one that has the regular Italian superstars garlic, chilli, olive oil and pasta. Each playing his part perfectly yet consummating every other component of the dish perfectly to form a masterpiece. I added a dab of butter just to give it that salty complexity. The rest just fell into place like the perfect dance moves of a ballerina. I once seen an Italian chef say on TV “If you cook Italian food well, it sings”. If that was the benchmark, I promise, sing it did. Cook the spaghetti as instructed on the pack. Drain and keep aside. Drizzle some of the olive oil and mix. Keep about 3 tablespoons of the olive aside and heat the rest along with the butter till you hear a sizzle. When the oil is hot, add the garlic and allow it to cook till it is reddish brown. Add the prawns and the parsley and cook till prawns are pink and getting done. Now add the red chillies and the herbs and stir well. Lastly add the spaghetti and mix well so that the olive oil coats each strand well. Just before you serve, drizzle some olive oil over the spaghetti. Spaghetti needs a lot of water to cook. A safe ratio is 1 liter water for every 100 grams. The same goes for the salt. Add enough salt to make the water more salty than you usually prefer. 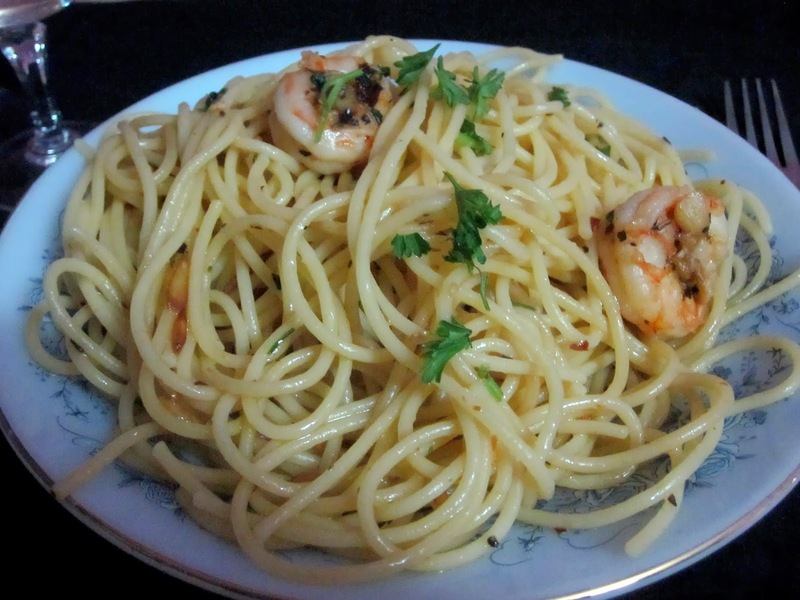 Unlike noodles, do not add oil while cooking the spaghetti or any pasta for that matter. Adding oil prevents pasta from absorbing the flavour of the sauce.